Voice of the City's longest running program, Fine Arts for Kids engages young people ages 3 to 14 , from all backgrounds, to develop their talent and foster a life-long appreciation of the arts. One of our most popular programs, Fine Arts for Tots focusses on Music & Movement for ages 12 to 36 months. Currently running as a nominally charged program at Mozart Park under the Instruction of Artistic Director, Dawn Marie Galtieri. A FREE program at Mozart Park, currently running as a Mixed Media class under the instruction of artist teacher, Dylan Cullison. 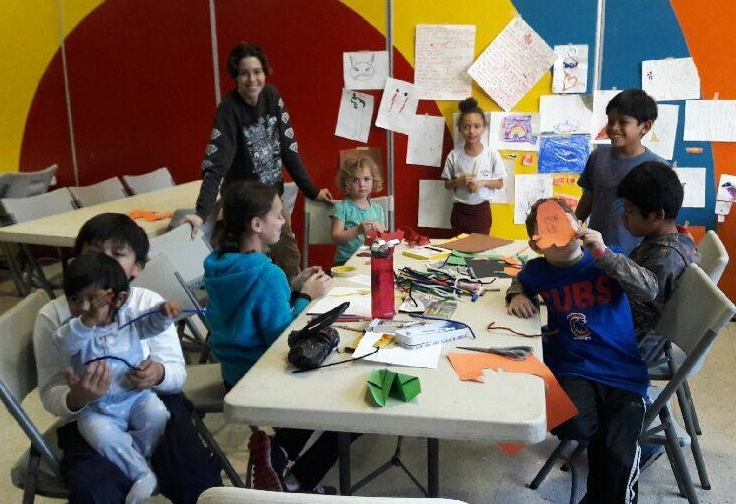 Since 1999, Fine Arts for Kids has introduced Art, Dance, Theatre, Music, and Photo/Film/Video (often taught in collaboration) to hundreds of Logan Square children, regardless of their ability to pay. A program parents have depended on since the 2012 strike. VOTC holds camp on all CPS days off, based on registration. We average 8 to 12 children, but have capacity for more. Highlighting two arts classes, Theatre and Visual Art with lots of relaxed, creative play in between!